Tools To Procure New Members! If you don’t find what you are looking for, contact us. We are looking for more fun ideas to add all the time. Items are added to the store based on input from Pond members. Let us know what you would like to have to help you procure new members! Want to go old school and mail a check? That is ok too. Click the button below to print an order form. Also, remember to use your sponsor’s member number link when you visit this store so they get credit! 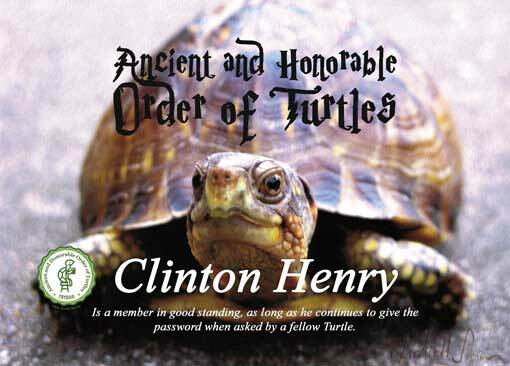 The member link looks like this: www.turtleclub.us/turtle/11 Where the “11” in this instance is Old Newsboys of Flint. So if you don’t have a sponsor and want to help Old Newsboys, click that link and they will get credit for your purchase! Read more on the About page how Old Newsboys helps kids at Christmas and how to get your own member number to help your charity of choice. Scroll down to view all of our products, or click a link to view specific categories of either in house items or custom print. Turtles have been procured far and wide in a variety of ways. There are endless varieties of ponds out there with unique style. One of the more popular types of cards that I frequently run across and my first card in the 70’s was from the International Association of Turtles. Below is my updated version of an IAT card with a place to write in your pond name, member and sponsor information. In-house items are carefully stored at Turtle Club US Headquarters where Dave personally packages the items and delivers them with a note. These are items that can be bought in quantity to pass on the savings to Pond members like you! Inspiration strikes occasionally for a new T-Shirt design. They are all available in our shop. Customize your own shirt with our Personalized options. Custom Print items are printed once you order them. Perfect way for us to get crazy with designs and variety for you to choose from. We use a Detroit based printer for the shirts and many other items. The personalized member cards ship out of Kentucky generally. Beach G920 Gildan Heavyweight Crewneck Sweatshirt 9 oz.